What is Femoral Nerve Compression? Why do I have weakness climbing stairs? The muscles (left) and the skin (right) supplied by the Fermoral Nerve. Anatomy: The Femoral Nerve runs down the front of the thigh. It supplies sensation to the skin of the front and inner thigh. 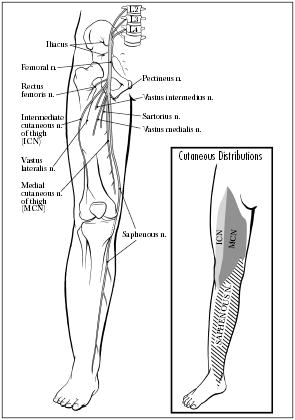 As the nerve goes into the lower leg, it changes name to the Saphenous Nerve which supplies the inner aspect of the calf stopping at the inner ankle bone. The Femoral Nerve comes from the area of the spine known as Lumbar 2, 3, and 4 spinal segments. As it leaves the spine and goes downward toward the thigh, it passes through the psoas muscle which is the strong strap muscle that runs nearly vertically on each side of the spine. It continues downwards and under a strong strap called the Inguinal Ligament which runs roughly in line with the groin fold. Apart from the skin sensations mentioned above, the Femoral Nerve also supplies sensation and the ability to move to Quadriceps muscles on the front of the thigh and several muscles of the groin area. See the adjacent diagram. Causes: There can be several causes of injury, including direct trauma such as a blow to the lower abdomen, the groin or the front of the thigh. Diabetic muscle wasting is the most common cause of Femoral Nerve neuropathy. Also, the nerve can become entrapped as it leaves the spine or (more commonly) as it runs below the inguinal ligament at the site of the groin fold. At this point, the Femoral Nerve is in closely surrounded by the head of the femur (thigh bone), several muscle tendons and the soft tissue around the hip joint. It is vulnerable to compression from these structures. This can occur if the leg is forced into a ‘frog’ position for an extended period, from pressure from the baby during pregnancy, due to a traumatic blow or due to a build up of pressure from a tumour or significant intra-pelvic bleed. On occassion, the ‘bone cement’ used in hip replacement has been able generate enough heat when setting to cause Femoral Nerve damage. Symptoms: The symptoms of a femoral compression / neuropathy can include pain in the groin fold area that is somewhat alleviated by moving the leg half way to a cross-legged position. There may be odd skin sensations on the front of the thigh and the front / inner shin area. Sufferers will usually complain of knees buckling from weakness, pain around the knee cap and weakness walking upstairs. Often the feet will have to meet on a stair, rather than taking each in turn. On examination, hip flexion (lifting the thigh up) and knee extension (straightening from bent) are usually weak compared to the unaffected side. The Patella Tendon reflex may be impaired. Pain may be worsened by hip extension (moving your foot behind you while keeping the pelvis straight). A neurologist can find definite evidence of a problem using a nerve conduction test. Treatment is entirely dependant on the cause of the cause of the compression.